I’ve owned several of these delightful junior sidecars, which are ideal for fitting to a bicycle, cyclemotor or autocycle. After much searching, I’ve recently managed to find some Watsonian publicity material on the juvenile sidecars, and I’ll upload it in due course as there is very little available on the internet for these rare items. The sidecar pictured here I’ve owned for many years. I intend to fit it to my Rambler Autocycle when it has been MOT tested. You can see it below attached to the previous owner’s autocycle. I’ve not yet decided which bike I’ll fit with the sidecar below. It’s a commercial set-up I created recently. 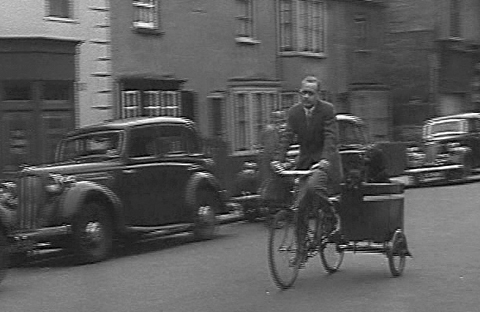 As you can see from the cutting above, the body is easily detachable, after which you can fold the sidecar onto the bicycle so that it takes up not much more room than a solo bicycle. Though it’s very rare to know much of the early history of the remaining vintage bicycles on the road today, I do know about the sidecar pictured below. I bought it from Andrew Bothwell. The picture below was taken in Bognor Regis in 1954. Andrew, aged two, and his brother aged four, are in the home-built aluminium-bodied sidecar, with Mr. Bothwell on his Raleigh Gent’s Roadster. The sidecar body has long since perished, but the sidecar frame and fittings were still in good condition. As you can see from the Watsonian advert below, you could buy the sidecar chassis new in this form. So I bought a metal box for it, had the rear wheel spindle nut re-manufactured, and fitted it to my 1923 Raleigh Roadster to recreate the set-up used by Mr. Bothwell. Thomas Fredrick Watson was the founder of one of the best known motorcycle sidecar manufacturers in the world, Watsonian. Fred, as he was known, did not like the idea of parking his motorcycle and combination outside his terraced house in Coneybere Street, Balsall Heath so each night he would laboriously remove the combination so he could take the outfit through his narrow entry to the safety of the back yard. Each morning Fred would have to go through the same procedure in reverse and then re-assemble the combination before setting off for work as a handyman and jobbing builder. Fred got tired of all this and was soon looking for a radical solution. In 1911, after experimenting with a shoe box, he invented and patented the worlds first collapsible sidecar. Not only could Fred now get up his entry he also had sufficient interest and demand for his new product to start manufacturing from his small house in Balsall Heath. Fred built the sidecars and Mrs Watson ran up the upholstery on her sewing machine! The new company was called the Patent Collapsible Sidecar Company Ltd. and each sidecar was priced at 12 guineas. Although it was a great idea it was slow to take off and had limited appeal. The introduction of conventional wickerwork and coachbuilt bodied sidecars in 1912 changed the companies fortunes and started them on the road to universal success. Sidecars had been around for a few years previously and were known as ‘Sociables’. Early sidecars were open, without suspension and with basketwork bodies of either cane or willow. Around 1910 fabric covered wooden frame construction as used for motor cars became popular. Coachbuilt bodies as used by horsemen were a minority but started to replace the baskets from 1920 onwards. At first steel panels were used but with the wartime shortage of steel, plywood panels were substituted. Sidecar frames were made of ash, as were some car frames! Some unscrupulous manufacturers passed off the cheaper and less durable pine as being ash! Fred at some stage changed the name of the company to the Watsonian Folding Sidecar Company Ltd. and we know that one of his first models was called the Monarch to commemorate King George Vs coronation. Fred developed what he called his featherweight chassis weighing less than 40llbs., the body was very light and he was a very early user of aluminum panels. This body could be tilted to allow easy access to the engine. The featherweight was soon being used by the speed merchants of the time at Brooklands and in hill climbs and trials and it’s popularity did much to increase Watsoninans profile. From that time on Watsonian would always be the main name associated with sidecar motorcycle sport. In 1913 one of Watsonian featherweight sidecars coupled to an AJS motorcycle broke 3 world records at Brooklands. Also in 1913 they exhibited at the Olympia Show with the Watsonian Colonial Cabriolet. This model was available with metal or wooden panels, had underseat and rear lockers and a spare 2 gallon petrol tank in the nose. At this time Watsonian were claiming that they had 30 different models of sidecars although some must have had only minor differences. In 1915 the London department store Gamage’s sold their own brand sidecareete (this was the name given to lightweight sidecars) the chair being a lightweight Watsonian. From this period onwards several motorcycle manufacturers offered their own sidecars, Sun, Norton & BSA for instance. All except BSA bought the bodies in from specialists making the frames themselves. In 1916 the Ministry of Munitions put a ban on the production of motor cycles and cars for civilian use. Watsonian began immediately building completely covered sidecar ambulances with special springs. In 1922 the range comprised of 10 models which included a commercial box and a commercial truck (a box with an open top and partly open sides). they also introduced a type of shock absorber in the way of a thick rubber washer which gave a small amount of give which reduced chassis breakages. Also in the twenties the sidecar taxi became popular, Royal Enfield , BSA & Watsonian were early entrants into this market, Watsonian teaming up with Excelsior to produce a two seat side by side cab of the Landaulette type with the back portion of the top capable of being lowered. Triplex supplied glass for the screen which also could be lowered. Watsonian moved to Branston Street in Hockley in 1922 due to the large increase in business, the company claiming that their output was the same as BSA’s at around 5000 units per year. In 1923 a commercial box was made in the form of a Lodge sparking plug. !923 also saw the opening of Watsonians first showroom in Great Portland Street, London. Competition in the side car business was fierce and in 1922 William Lyons started operations in Blackpool with the Swallow Sidecar Company the forerunner of Jaguar cars). They became very quickly established as one of the best manufactures in the country with state of the art bodies with frames being made by Coventry manufactures such as Fulford & Mills. Sidecar racing began in 1923 at the Isle of Mann TT the first race being won by Freddie Dixon with an aluminum body supplied by Watsonian. Sidecar racing was dropped in 1925. In 1926 Fred’s son, Ron, began working for the business. Ron had previously worked for an advertising agency and his experience would prove invaluable. It was at around this time or earlier that Cliff Bennet started with the company, Cliff started on the factory floor working his way up to eventually become managing director. The 1926 General Strike lead to drastic cuts having to be made and after the spring sales many workers were sacked. The aptly named Kwicfit chassis was launched in 1926, the main part being removed from the bike in seconds. This innovation was very successful and remained in production till around 1966. In 1926 the cost of a sidecar combination was roughly half that of an Austin 7 which retailed at 127 pounds. By 1936 the cost of the Austin 7s had been drastically reduced due to mass production but not so the sidecar and there was now only a difference of around 20 pounds in price.. In 1930 the companies name was changed to the Watsonian Sidecar Company Ltd., and the first annual Watsonian rally was held. 1930 would best be remembered however for the fire that burnt the factory down. A spark from a passing locomotive of the Great Western Railway started a blaze in the cellouse paint factory. After a spell of temporary accommodation Watsonian eventually moved to a new factory in Albion Street, Greet, near Tyesley in Birmingham in 1931. The tradition of naming sidecars after English towns started with the Oxford a classic single seater with a sunshine roof! A Cabin Cruiser model was also introduced. In 1935 new models were the Launch Sports and Launch Cruiser which had boat lines. In 1932 the team trophy in the International Six Days Trial was won with a standard Watsonian chair coupled to a Sunbeam motorcycle. Also in 1932 the company produced the first purpose built competition chassis. In the 30s Watsonian introduced their own hire purchase scheme totally financed by the company. The company also diversified its manufacture offering a pedal powered toy aeroplane and a range of baby sidecars for use with pedal cycles. The Milverton range of accessories, windscreens etc were made at the factory and even light cars were made in 1936. Fentons of York also made juvenile sidecars.